You may have seen the ads proclaiming “I kill one woman every minute” and the teasers saying things like "I don't care about your hair color. I don't care about the color of your skin. I'll take you all." Now, in an exclusive interview with Yahoo Global News Anchor Katie Couric, Barbra Streisand has revealed the identity of this mysterious, number one ladykiller: heart disease. Since 1984, heart disease has killed more women than any other cause, killing more women than every type of cancer combined. And yet, far too many women are unaware of the threat, let alone the symptoms. 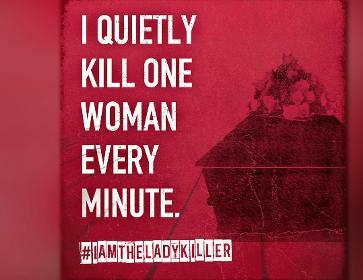 To combat this awareness problem, Barbra Streisand has created the #Iamtheladykiller campaign. “It's like doing a movie poster,” says Streisand, who has been the driving creative force behind these edgy public service announcements. “It's about how you reach people.” And Streisand knows a thing or two about reaching mass audiences: She recently set a record with her tenth #1 album – becoming the only artist to have had a #1 album in each of the last six decades – and she is in that rare class of performers to have won Oscars, Emmys, Grammys, and a Tony. Applying her creative talents to raising awareness about heart disease in women isn't the only connection to Streisand's movie career. She first started becoming aware herself as an offshoot of researching the 1983 film Yentl, which she wrote, directed, produced, and starred in. The title character learned that for a woman to be taken seriously, she had to look like a man. Nearly a decade later, Bernadine Healy, then the director of the National Institutes of Health, coined the term the “Yentl Syndrome,” referring to cases where women with heart disease are misdiagnosed because their symptoms don't look like a man's. While men experiencing a heart attack are likely to have severe chest pain, women are somewhat more likely to experience shortness of breath, nausea/vomiting, and back or jaw pain. Other symptoms women should pay attention to are dizziness or fainting, pain in the lower chest or upper abdomen, and extreme fatigue. The bottom-line message throughout Streisand's campaign: heart disease in women is preventable, but only if women and their doctors educate themselves about the risks. To learn more about Barbra’s campaign, you can visit https://fighttheladykiller.org, and, as always, talk with your doctor.